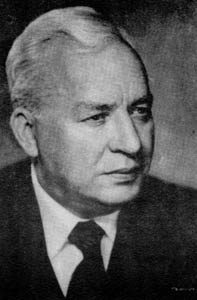 Witold Rudziński was born on 4 March 1913 at Siebiez (Russia). He studied composition at the Mieczysław Karlowicz Conservatory of Music in Vilnius under Tadeusz Szeligowski and piano under Stanisław Szpinalski. He continued his studies in composition in Paris under Nadia Boulanger and Charles Koechlin, and also in the Gregorian Institute (1938-39). In addition Rudziński graduated in Slavonic philology from the Stefan Batory University in Vilnius (1936). In the years 1939-42 he was in charge of the theory class at the Vilnius Conservatory of Music. Since the war he has been active in the field of Polish misical life, occupying the positions of: professor at the Conservatory Music in Lodz (1945-47), director of the State School for Cultivating the Love of Music (attached to the Folk Music Institute in Łódź), music editor of the Publishing Cooperative “Czytenik” (1945-52), member of the State Publishing Council (1946), director of the Music Department in the Ministry of Culture and Art (1947-48), Artistic Director of the State Philharmonic Society and of the Warsaw Opera (1948-49), chief editor of the periodical “Music” (1950-56), chairman of the Polish Composers’ Union (1951-52), as well as that of its Warsaw Section (1962-68 and again 1977-1981). In adition to composition he was engaged in teaching, musicography, writing articles for music magazines and popularizing music. He was the head of Doctoral Studies at the F. Chopin Academy of Music in Warsaw. Witold Rudziński is the author of several books published by PWM, such as a didactic work How to Listen to Music (1947), a popular work of an encyclopaedic nature, Music for Everyone (1st ed.-1948, 2nd ed.-1966), books What Is Opera (1st ed.-1955, 2nd ed.-1960), Composer’s Technique of Bela Bartok (1964), About Music in the Company of a Loud-Speaker (1975), and his magnum opus, a treatise Musical Rhythm. He also wrote a two-volume comprehensive biography of Moniuszko (vol.1-1955, vol.2-1961). Its popular version was published in 1954 in the series Short Music Monographs (5th ed.-1978). In the series Pocket Operatic Library appeard Rudziński’s studies of Halka (1954, 1972) and The Haunted Manor (1956). The composer’s publication on the subject of Moniuszko include also a number of articles published in music and literary periodicals. Witold Rudziński received several prizes and state awards, such as the Prize at the Second Festival of Polish Music for his Quintet for Flute and Strings (1954), the Medal of the Tenth Anniversary of the Polish People’s Republic (1955), the Officer’s and Commander’s Cross of the Order of Poland’s Revival (1955 and 1960 respectively) for his contribution in the field of culture and art, the Award of the Third Degree of the Minister of Culture and Art for his composer’s activity in the domain of operas (1963). He also won the First Special Mention at the Prince Pierre de Monaco Competition for his opera The Dismissal of the Greek Envoys(1963), First Prize at the Hommage a Grieg Competition of the Music Society “Harmonien” at Bergen for his Pictures from the Holy Cross Mountains (1965) and the Award of Merit for his activities as organizer of cultural activities (1979). Hurry up, my Girl !